Irish immigrants flocked to Cleveland after the potato famine in 1848. Along the Cuyahoga River in Ohio City grew a concentrated Irish neighborhood known as Irishtown Bend. It was so named because of the Irish shantytown located along one of the curves of the Cuyahoga River. 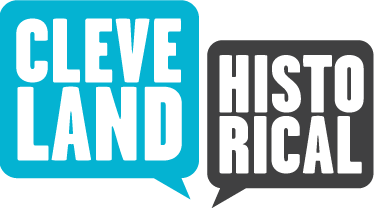 This neighborhood centered on Riverbed Street, but ranged from West 25th Street eastward to the Cuyahoga River, and between Detroit Avenue southward to Columbus Street. Irishtown Bend was located in the heart of Cleveland's industrial infrastructure. A significant number of Irish worked in the shipping industry that thrived along the Cuyahoga River as part of the extensive Great Lakes trading network. For Irishtown Bend, the shipping industry came in the form of ore docks used to load and unload the massive freighters that traversed the Great Lakes. Although essential to Cleveland's industrial well-being, trade, and Irish population, the Cuyahoga River proved to be its own worst enemy. Cuyahoga literally means crooked river, and it earned a sinister reputation because of how treacherous it was to navigate, particularly in a 500-foot freighter. In 1901, Cleveland discussed straightening the Cuyahoga River to alleviate the problems of navigating it. The first detailed study did not begin until 1912, and work did not occur until the mid-1930s, continuing intermittently into the '30s,'40s, and '50s. When discussion of altering the Cuyahoga River began at the turn of the 20th century, the fate of the river and those who depended on it became untenable. Proposed plans involved cutting land to make river bends wider, or completely re-rerouting the river. The possibility of eminent domain threatened the homes and livelihoods of those living and working along the river. The approval of an improvement plan in 1929 called for the widening of the river at Irishtown Bend, which required the demolition of the shanty homes erected on its hillside. Dredging of the river did not occur at Irishtown Bend until 1938, but even after this initial alteration, the Plain Dealer reported that Irishtown Bend was still a nuisance. By the mid-1950s, what was left of Irishtown Bend's residential area was either dilapidated or abandoned, and the area was razed in 1958 to prepare for a second attempt to alter the river. River improvement was not the only reason for razing the Irishtown Bend slums, however, as a $10 million public housing project had also been approved in an attempt to revitalize the neighborhood. The highlight of the housing project was a pair of 16-story buildings called Riverview Towers, which still prominently stand. Unfortunately, the housing project did not fulfill the proposal's intent to revitalize the neighborhood. While the entire housing project was intended to attract residents of diverse stages in life, young and middle-aged suitors mistook the project as one exclusively for elderly residents. Local magnate Jeffrey P. Jacobs planned further development of Irishtown Bend in 1989 but a geographical survey revealed the remainder of undeveloped land at Irishtown Bend was too unstable for any further development. Irishtown Bend: This panorama reveals much about Irishtown Bend's culture, facing east from the west bank of the Flats. On the left are the shanty homes, which housed the working-class Irish. Historically, these inhabitants were known as shanty Irish. The working-class Irish worked towards economic and social ascension, and if successful moved west into the area around Franklin and Detroit. Middle and upper class Irish in this neighborhood were historically known as lace-curtain Irish. Image courtesy of Cleveland State University. Michael Schwartz Library. Special Collections. 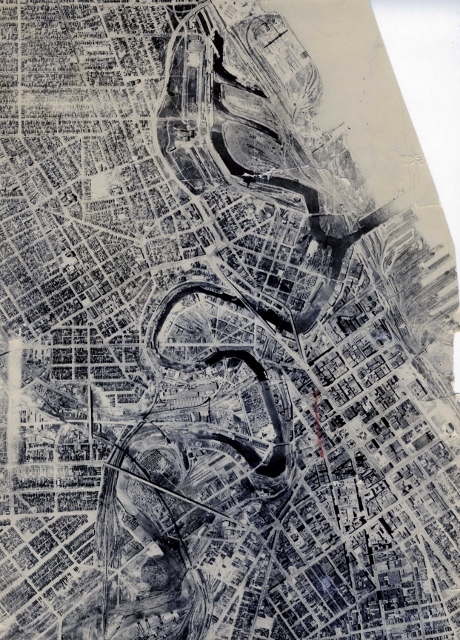 The Angle: The Cuyahoga River as seen from a 1925 aerial photograph. Much of another Irish neighborhood, known as the Angle, located in the Flats around the bends near the mouth of the river, can be seen in this photo. Known for it's Irish population, the Angle earned its name from the steep graded hills along the river's bends where the working-class lived in shanty homes. Image courtesy of Cleveland State University. Michael Schwartz Library. Special Collections. 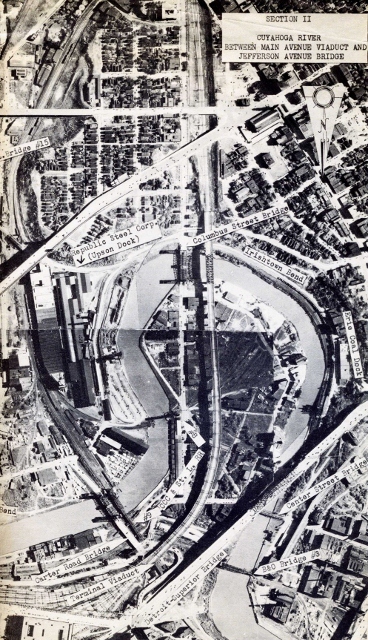 Tension in 1909: This section of a larger panorama from 1945 is rotated 90-degrees clockwise to highlight Irishtown Bend and the coal dock that existed on the northwest bank. The coal dock at Irishtown Bend was the center of national attention during a strike in the spring of 1909. Sailors and dock workers all over the Great Lake's shipping network, particularly in Cleveland, Buffalo, Chicago, and Detroit, fought for better schedules and wages. During the strike, this coal dock hosted several riots. One riot strikers stoned a freighter, and another they fired upon police. Image courtesy of Cleveland State University. Michael Schwartz Library. Special Collections. Taking the 'Cuyahoga' Out of the Cuyahoga River: Prospectors proposed several plans to alter the Cuyahoga River, and this 1917 blueprint outlines a drastic plan to straighten the river. The state of the river in 1917 is highlighted in turquoise, and the proposed rerouting is highlighted in orange. Regarded unfeasible, the plan was never approved. Irishtown Bend is located just left of center in the blueprint, along the northwest bank of the bend curving westward. Image courtesy of Cleveland State University. Michael Schwartz Library. Special Collections. Work In Progress: Rotated 90-degrees counterclockwise, this 1941 blueprint shoes progress of the approved Cuyahoga River Improvement plan. Checkmarks indicate completed work, and the shaded areas indicate where the river will be widened by the end of the project. Note the extensive shading around Irishtown Bend, located on the left panel of the blueprint. Image courtesy of Cleveland State University. Michael Schwartz Library. Special Collections. Treacherous Waters: Although the current of the river is docile, the same cannot be said about the river's path. Two dredge boats proceed cautiously on April 28, 1943, while a tugboat sinks on the right side of the river after maneuvering too close to the bank. 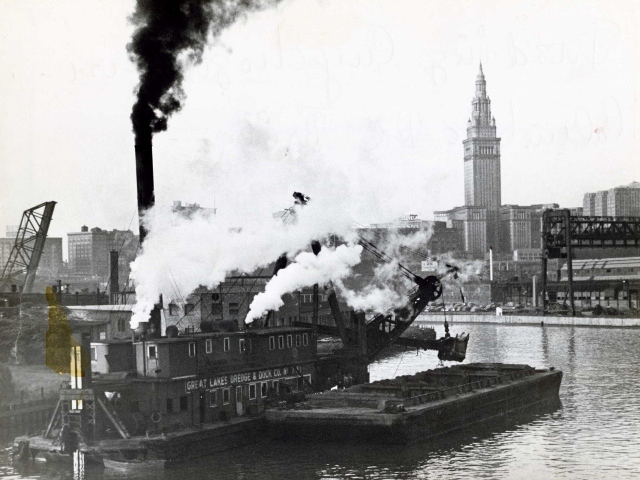 Historically, Irish immigrants living in the Angle and Irishtown Bend crewed Cleveland's tugboats. The scene is ironic, because the narrow bends in the Cuyahoga River are exactly what the dredge's intended to fix. Image courtesy of Cleveland State University. Michael Schwartz Library. Special Collections. A Big Catch: Just as a fish reeled in on a line, this 1951 Jaguar was snagged during dredging of the Cuyahoga River at Irishtown Bend in May of 1959. Owner Robert Conklin, resident of 299 E. 326th St. in Wickliffe, reported the car stolen in January of 1958. The car appeared to have been wrecked and burned prior to becoming submerged. Image courtesy of Cleveland State University. Michael Schwartz Library. Special Collections. Dredging at the Columbus Rd. 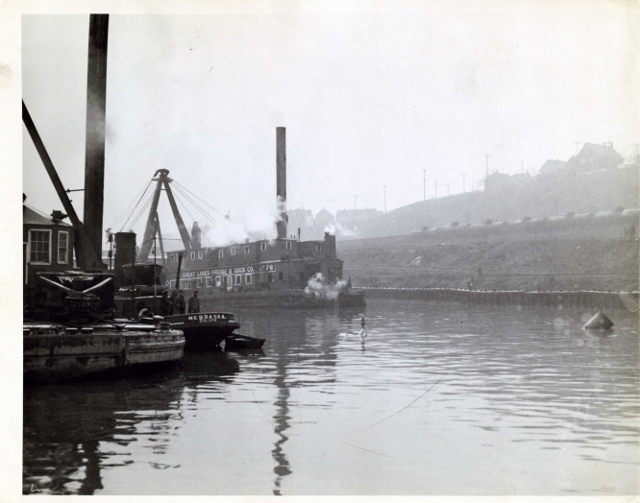 Bridge: During the first half of the 20th century, Cleveland underwent a significant project to alter the Cuyahoga River in order to make it more accessible for freighters and other maritime commerce. Here, a dredge from the Great Lakes Dredge and Dock Co. operates to make the river deeper and wider near the Columbus Rd. Bridge in 1947. Image courtesy of Cleveland State University. Michael Schwartz Library. Special Collections. 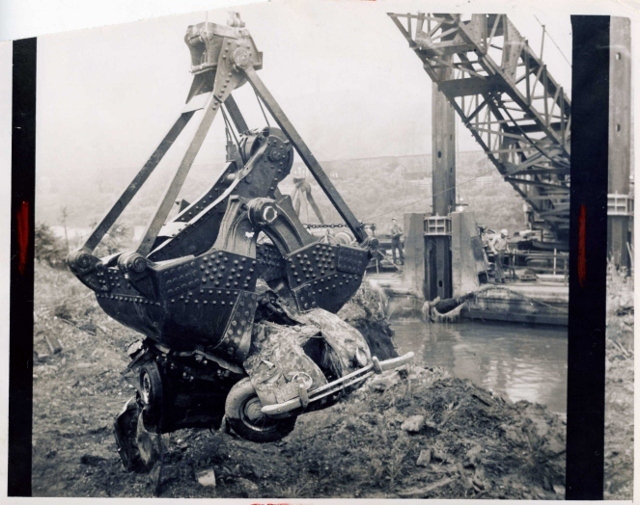 Matt Sisson, “Dredging the Bend,” Cleveland Historical, accessed April 19, 2019, https://clevelandhistorical.org/items/show/549.